The weather was legendary. At 9:00 it was already 20+ degrees and the day was only gonna get warmer. In short order our lovely guides Emily and Ivan from The Inside Line MTB arrived, shortly followed by a double delivery of Coolbus transport, ready to take us on the first part of the adventure. With such a large group, Emily split us into two smaller pods, one who would ride with her and one with Ivan. 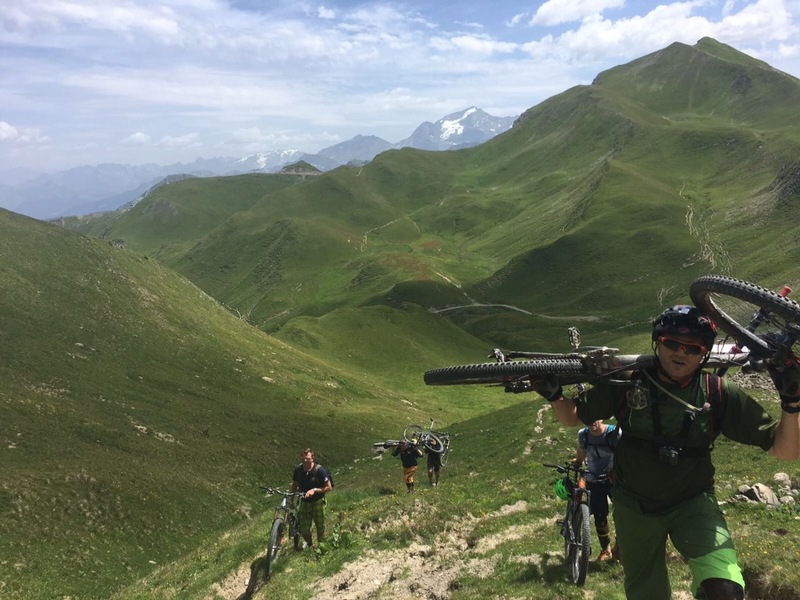 With a bit of last minute fettling and a safety briefing / rules of the ride digested (following on from the briefing the night before) and out of the way, we mounted our bikes on the Coolbus trailer and off we went. How many bikes you got? 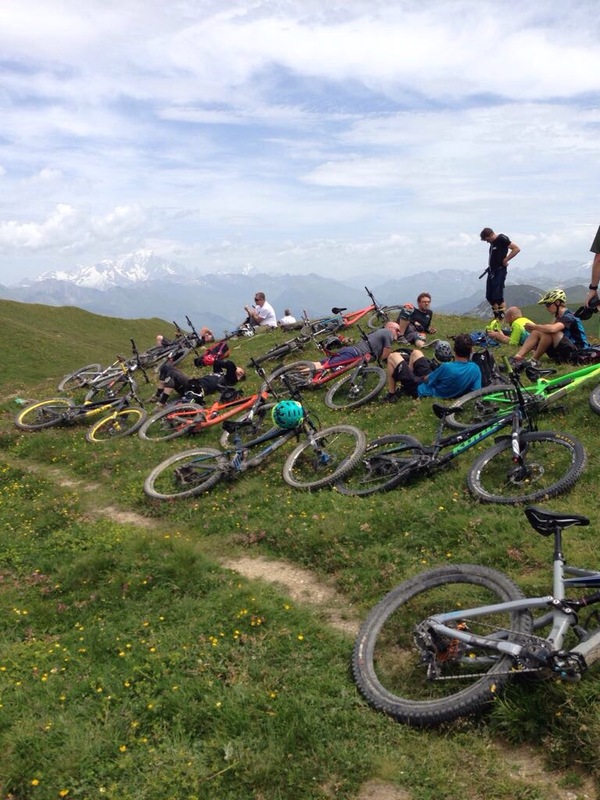 So the first stop was at the top of the resort in La Plagne, where we extracted our bikes, kitted up and bid farewell to the Coolbus guys. I’ve never been to La Plagne before (skiing or otherwise) and I have to say it was just a bit weird to be so high in a ski resort that was so totally and utterly shut. Ghost town does not do it justice. 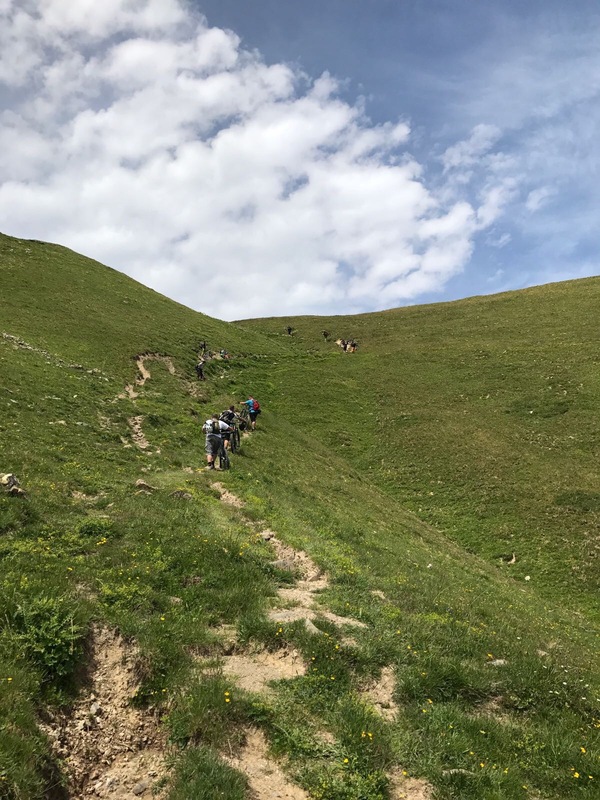 However, we were more focused on the destination than the start, so splitting into our groups, the cranks were turning and we started to climb. Not withstanding an almost immediate mechanical from Malc, we spaced out and immediately dropped down a fairly steep and rooty trail. It was at this moment I totally regretted not bringing my full face with me (advice from Emily) but I have to say, that was the one and only time. We made it (mostly, except James G) intact to the bottom and took a moment to gather some breath as Emily pointed up, up, up the side of the mountain, where a sliver of a track could be seen snaking into the distance to a pin prick of building stapled to the rock. “That’s where we’re heading”, Emily quipped, “That’s where the real climb starts”. This is where the realisation that there is no transport back and if you want to go down, you’ve got to go up hit me. With the phrase “20 to 30 minute hike-a-bike” echoing in my head, it was time to MTFU, go to my “happy place” and start spinning. At this point temperatures had comfortably nudged over 32 degrees and let me tell you, Oh My God that was a climb I will never forget. Alpine access roads are kind of “straight to the point”, and riding in the baking sun up something that steep for that long made the climb a bit on the “moist” side. Think the climb from Afan Trail center to the top – twice, and you get the picture. 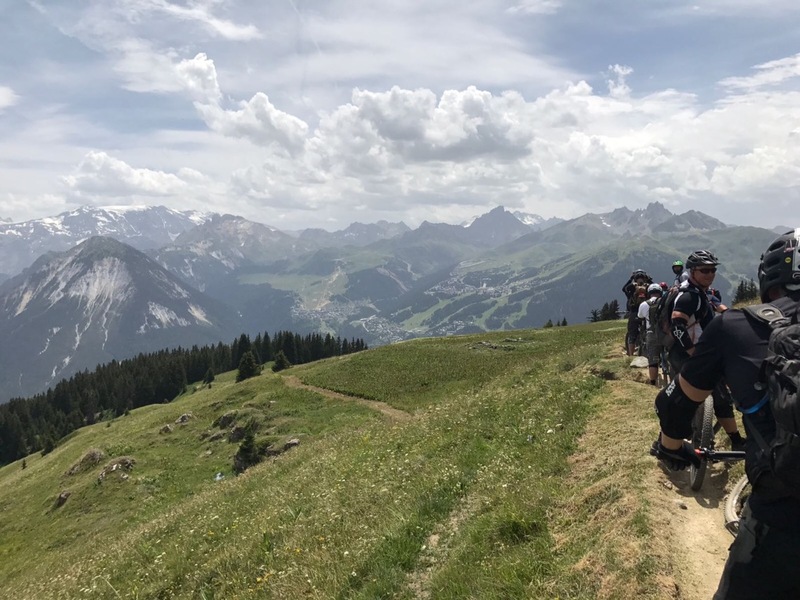 After a couple of brief sweety (thanks Emily) and water stops to gather energy and oxygen we collectively made it to the chalet – start of the climb proper. Temperatures had now reached a “friendly” 36 degrees and collectively we were sucking water like Spongebob after a vindaloo and I stared up at the flipping near vertical (seemed that way to me) goat track. The 20-30 minute hike a bike bit. Ah. Arse. This was, well, I’m not sure how to describe it. 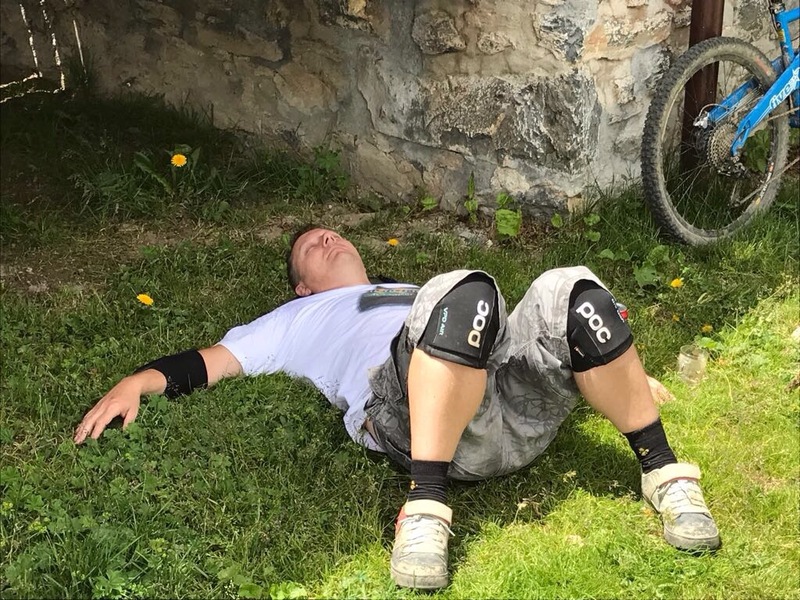 But with bikes being pushed / carried / dragged taking baby steps in the mounting heat, it has to be up there as one of the most grueling things I’ve done with my bike. Emily and Ivan were great – geeing us up where they could and leading the way to those of us who needed it. Stumble. Trip. Stop. Breathe. Push. Work legs dammit. Pick up the bike. Stagger. One step. Another. Stop. Breathe. Swear. Clear the swenge. Do it again. Dear God. I’ve made it. Collapse. Then open your eyes. Oh… My… God. What a view. 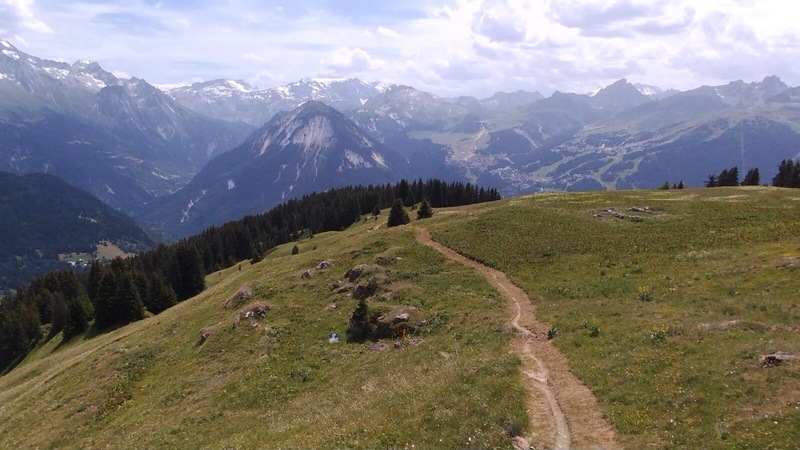 We’ve struggled up and over Alpine passes before but heading up to the top of Mont Jovet… this… this was simply stunning. Crumpled in a heap and on top of the world, packs were opened, baguettes demolished and our rapidly diminishing water supply was drained even lower (I had noshed nearly 2 litres by this point). We sat and took it all in and ate lunch at 2284 metres. “Shall we head down then?” came the cry. Emily and Ivan carefully explained the start of the traverse down to the Mont Jovet refuge where we could refill water (cold and fresh like I’ve never drunk!). They told us what we had to look out for and that it was just a shortish run until we could coffee up before the proper descent began. 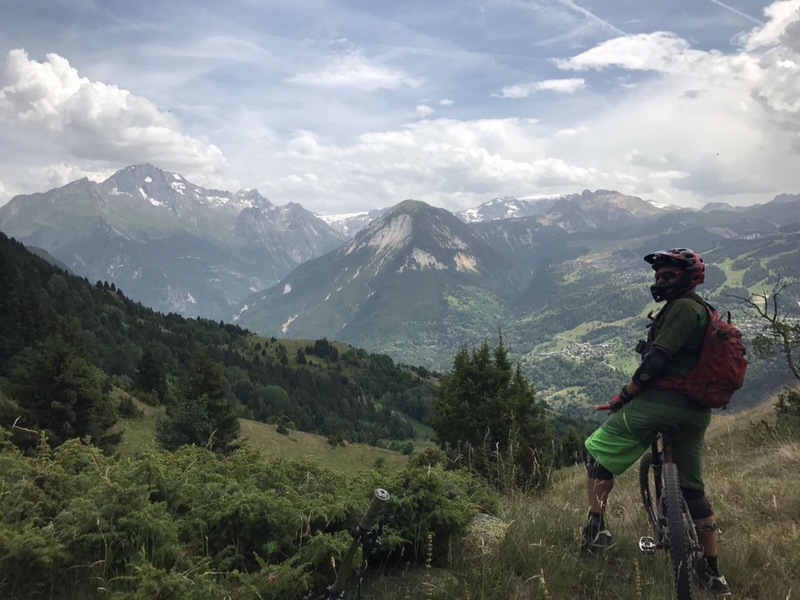 We set off in our riding pods again, on oh so sweet and narrow Alpine single track which just clung to the side of the mountain. 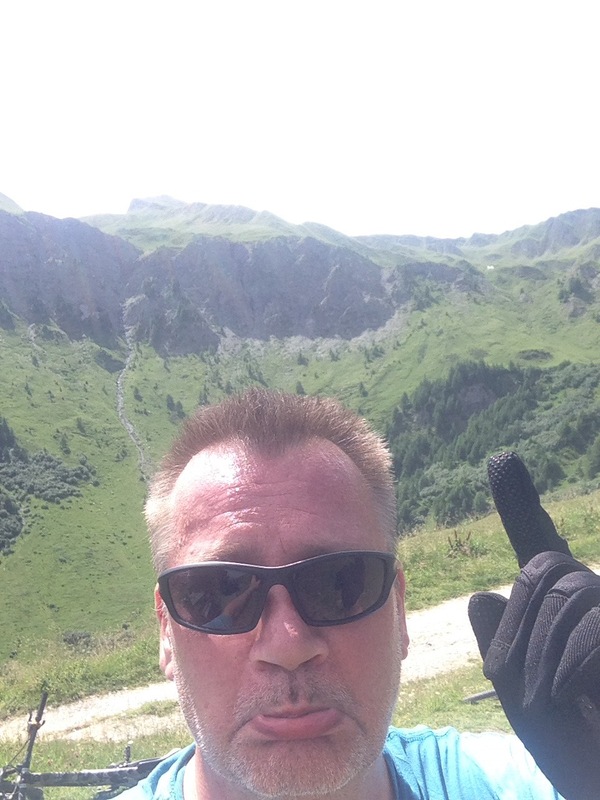 I was breathing hard at this point, either altitude or adrenaline, or both having its effect. I confess that I only glanced up a couple of times from fixating on the trail but when I did – just holy MOG – so, utterly beautiful. Following the trail, riding through hairdyer warm wind the refuge loomed like a big coffee shaped block of loveliness. I guess the refuge is run by the locals and it was packed with walkers (there’s a car park.. ahem… but moving on…) and was another welcome spot to get our minds back in order. Then the descent. 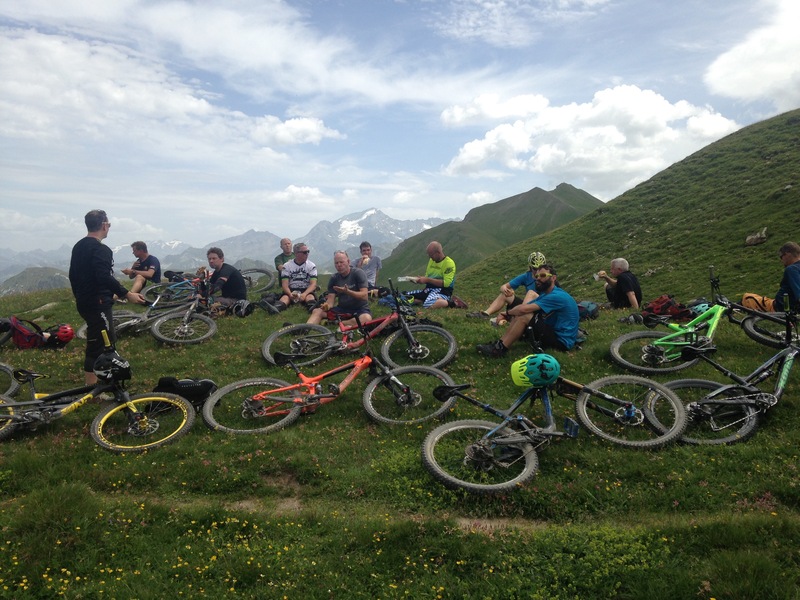 More wise words from the Inside Line guys and we pointed our rides down a perfect ribbon of singletrack that disappeared down and down and down. 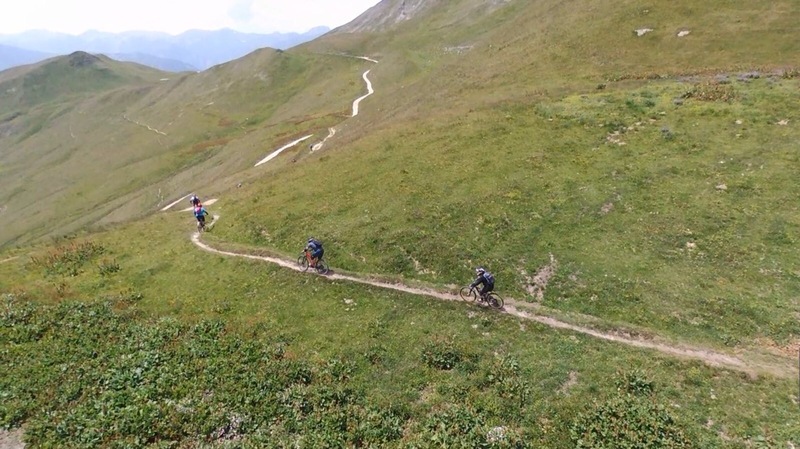 Matt launched the Bebop (we will one day get an edit of this together) as we were so far above the treeline this WAS the perfect place to film and we were off on a two hour descent. This section for me is mostly a blur if I’m honest. The trail was a cut through a Heidi-esque and perfect mountain side. Drops to the left were steeper than I care to mention in places but I can’t honestly be sure. I’m also not sure I’ve ever concentrated so much on a trail section in my life. 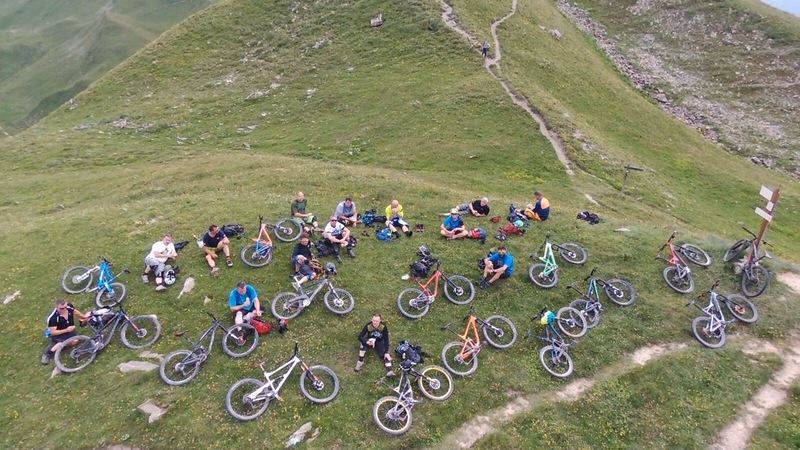 Not that it was particularly technical or difficult, mostly because it was just so goddam perfect all I wanted to do was not stuff up what I knew was shaping up to be one of the best riding days I’ve ever had. Unexpected rocks, narrow sections, deep ruts, loose marbles, marmots and drainage channels. Everything was attention grabbing. Everything was awesome. As we dropped lower, trees and OH MY GOD switchbacks appeared. How Ivan (who can pull a monster manual by the way…) and Emily got round those I will never know. We, to a man, did not. But the less said about that the better. I think one of the best things, for me, about riding with a guide, and particularly ones as talented on two wheels as Emily and Ivan is watching them (when you can keep up). Their line choice and technique was bloody awesome and although there was definitely no coaching going on, “school was definitely in” on that descent. The trees got thicker and the brakes got “squealier”. 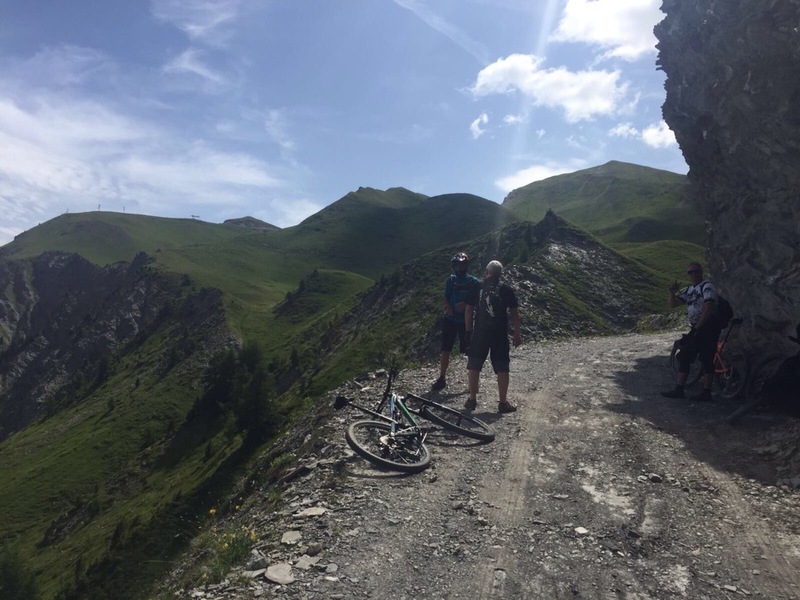 It was at some point as we followed the never ending trail down towards the high villages that I managed to a) melt my front brakes and b) break a couple of spokes. 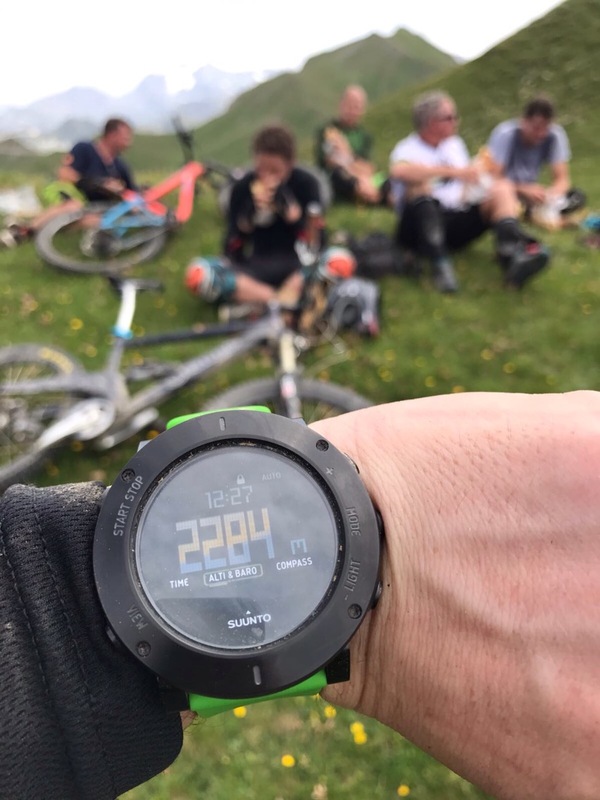 Down and down and down we dropped, wearying legs offset with a never ending supply of fresh adrenaline as the rounding of the next corner always revealed a view or an obstacle or something to absolutely focus the mind. We hit another village and another welcome water stop. 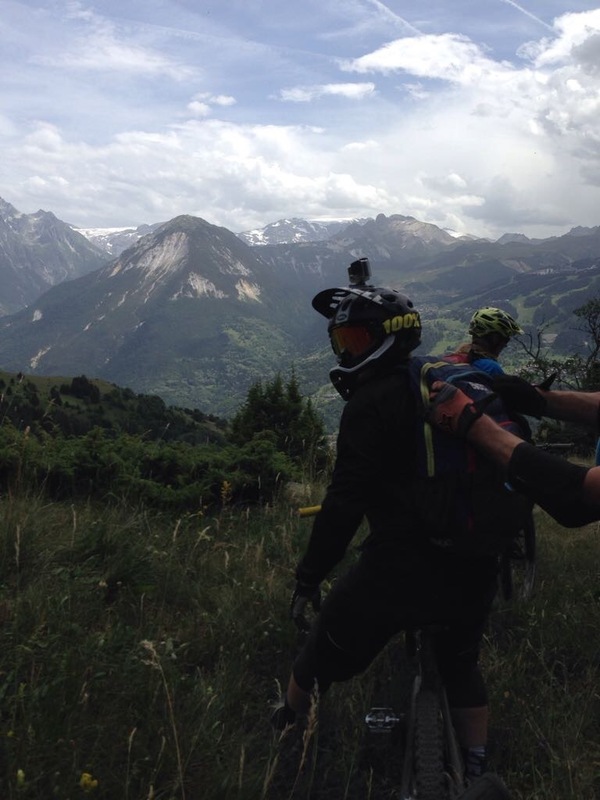 Some of us thought we were done, but oh no, another set of descents to the valley floor were calling. Then we were down, dear God – how long did that take? But not quite done. 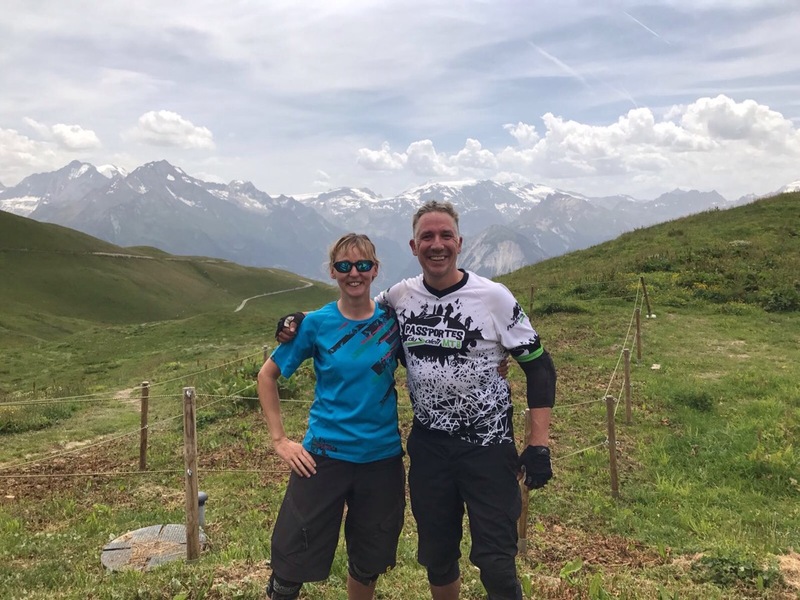 Emily and Ivan nudged us along a jaw droppingly beautiful river valley along to Moutiers. Then after Matt shouted the wonderful cry of “Intermediate Beer” we stopped to survey the damage. Glorious, golden and oh so cold beer. Never have I earned one that much. Not sure I’ve ever enjoyed one that much either. Definitely an “Ice Cold in Alex” moment for me. After that it was back to the train station and a comedy journey back to Landry for us. 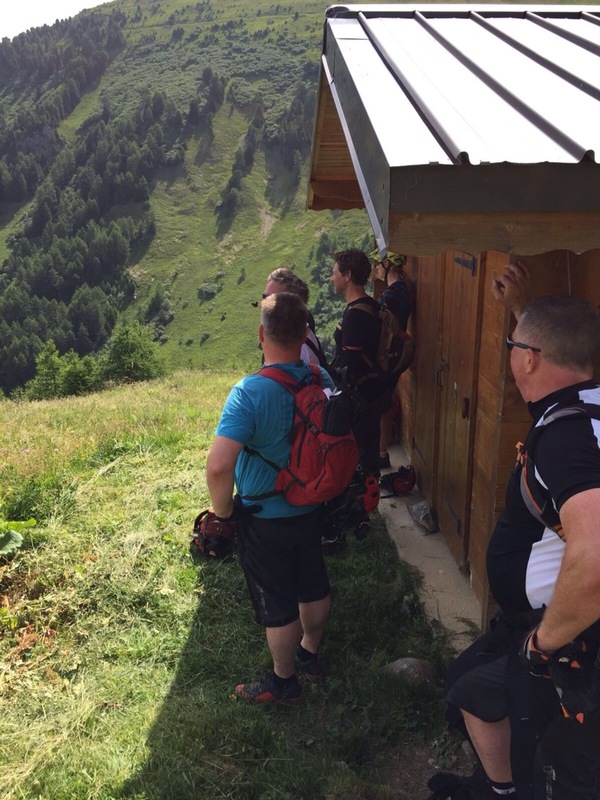 We bid farewell to our fantastic guides and somehow managed to drive back up to the chalet. And then you try to process it all. Still not sure I have. Not sure I actually can. 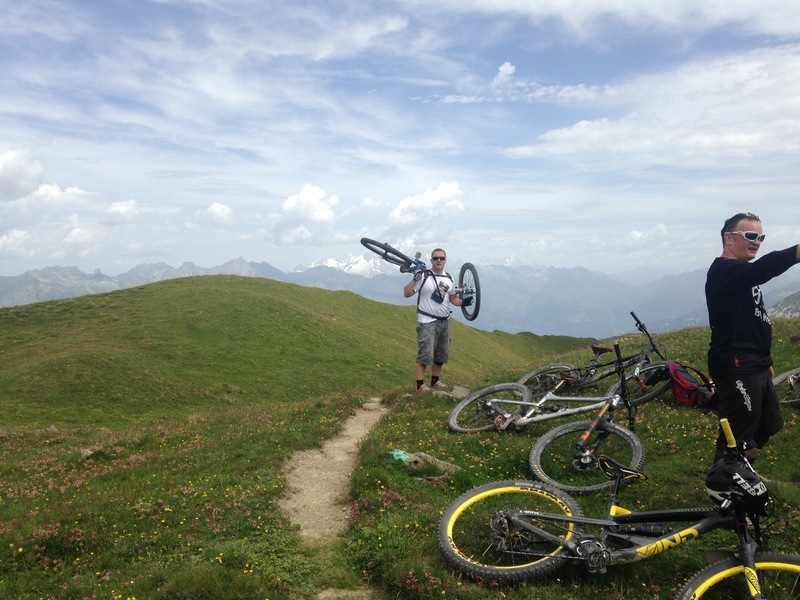 When you ride a bike, there are great days and there are great trails. And then there are THOSE days. 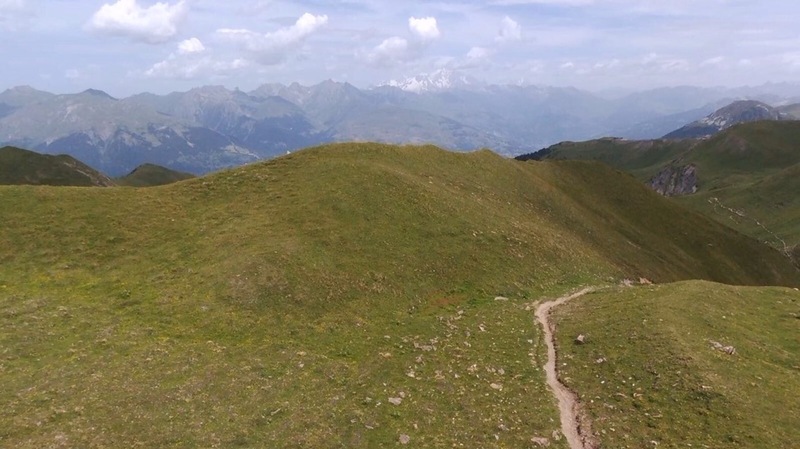 The absolutely, could not be better, perfect, perfect days and let me tell you, Mont Jovet was one of those. So thank you to Inside Line MTB and Emily and Ivan for an amazing day. 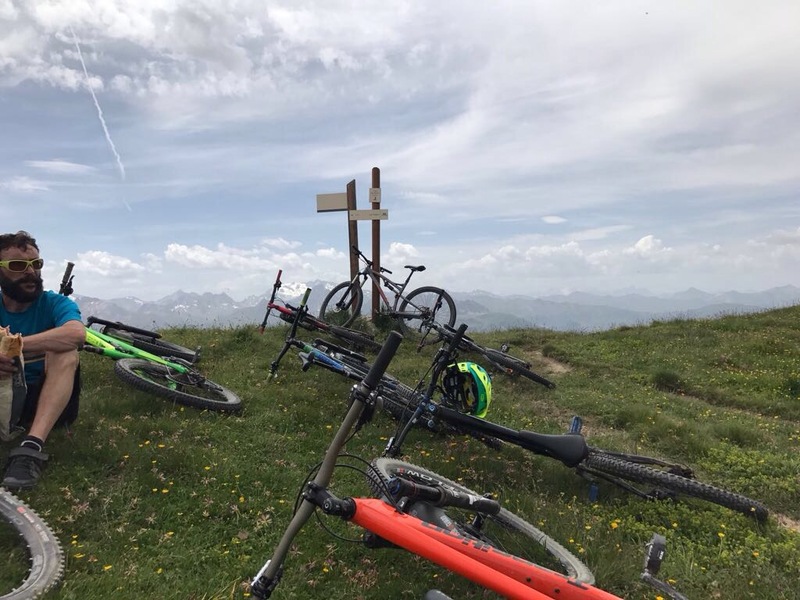 I have to say, if you are heading to Les Arcs with your bike – and trust me on this – do yourself a massive favour and contact Emily at Inside Line MTB. Go on a big day out (there are other routes) with Emily.